It’s never too late to learn something new … and crochet or knitting may just be the thing to learn! Knitting and crochet can help improve seniors’ emotional well-being, improve cognitive and physical abilities, and enhance quality of life. 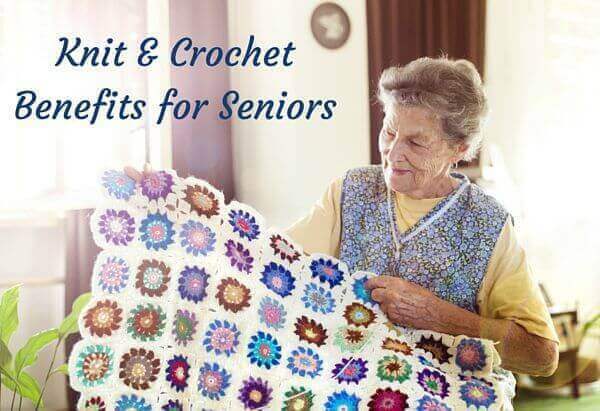 In this post we will explore some of these knit and crochet benefits and tips for seniors to encourage success. Hobbies and crafts like knitting and crochet have been shown to help improve some of the common issues that seniors face, including chronic pain, depression, isolation, and cognitive and physical impairment. The Centers for Disease Control and Prevention estimate that 80% of older adults have at least one chronic health condition and as a result may also suffer from depression. In Kathryn Vercillo’s book, Crochet Saved My Life, she explores how crochet and knitting have helped people with depression and chronic pain, both of which are risks for older adults (Centers for Disease Control and Prevention, 2015). In the study “Successful Aging And Creativity In Later Life” published in the Journal of Aging Studies, researchers studied a group of seniors ages 60 to 93 to explore creativity and it’s relationship to successful aging. They found that creative activity contributed to the six features they identified for successful aging: a sense of purpose, interactions with others, personal growth, self-acceptance, autonomy, health (Fisher & Specht, 1999). Knitting and crochet offer benefits to each of these key features. The rhythmic and repetitive movements are among the meditative and stress relieving qualities of knit and crochet and have been shown to calm and focus the mind while easing anxiety (Crochet Saved My Life, 2012). Other benefits include improved self esteem from the accomplishment of learning a new skill and completing a project. Crochet and knitting can also be a wonderful form of self-expression for older adults who may find a renewed passion and sense of freedom in choosing a project and colors. In addition, crochet and knitting groups can increase seniors’ overall well-being by providing a social outlet that can combat feelings of isolation and sadness by fostering a sense of community, an opportunity for growing friendships, and building a support network. This socialization is especially helpful for those those living alone or without family nearby. You can find crochet and knitting groups by asking around at your local yarn shop, library, place of worship, or senior center. Many of these places also offer charity knit and crochet groups that work to make items such as hats or blankets for hospitals or other organizations that provide the handmade items to those in need. Creating items for causes such as this have the added benefit of giving seniors a sense of purpose and to feel like they are making a difference. In a 2011 study published in the Journal of Neuropsychiatry & Clinical Neurosciences, authors Geda et al. found that seniors who engaged in crafts like knitting and crocheting had a diminished chance of developing mild cognitive impairment and memory loss. Aspects of these crafts such as learning new stitches, following a pattern, and counting stitches can help keep the mind active and engaged, and improve problem solving abilities and concentration. In addition to the cognitive advantages of knit and crochet, there are also physical advantages. The actual movements involved to knit and crochet can help improve dexterity and fine motor skills. By coordinating the small muscles in the movements of the hands and fingers with the eyes, seniors improve hand-eye coordination and fine motor skills. Studies show that keeping the brain (and body) active and stimulated may actually slow down the aging of your brain and reduce your risk of dementia or Alzheimer’s disease (National Institute on Aging, 2002). In addition to these knit and crochet benefits and tips for seniors, in my post, 5 Knit and Crochet Health Concerns and What You Can Do, I outlined some tips for reducing discomfort such as Carpal Tunnel Syndrome, Neck Pain, Back Pain, and Eye Strain. Thank you for sharing such a comprehensive blog. I’m not a senoir, but after my husband and mother died crochet literally saved my sanity. My grandmother crocheted well into her 70’s and it kept her mind and hands nimble. Thank you so much for mentioning Crochet Saved My Life. I love seeing new posts about the benefits of crochet! Thank you so much for this article! I teach a crochet class to seniors at my local Senior Recreation Center, and I’m going to share some of this article with them for encouragement. They don’t realize *all* the benefits they are giving themselves! So glad you found it helpful … I hope it inspires your class! I was glad to find this helpful information. I started crocheting at 20 yrs. old; self taught. My mother tried to teach me at an earlier age but I just couldn’t catch on, but she did teach me to sew, embroider, and other crafts. I am now 65 yrs. old, retired and have more time to do wonderful crafts of all types but especially crocheting. I appreciate the hints to reduce carpal tunnel, neck and back pain, and eye strain. I crochet in between chores and cooking. It helps relieve the stress and I can reminisce of times gone by and plan for the future, as to whom I’m making my new crochet project. I have a group of friends called the Golden Ladies (friends of the school district we all work or worked for) and they appreciate the Christmas ornaments, angels, doilies, rug mugs, etc. I also crochet items for my children and grandchildren. I am also teaching my grandchildren how to crochet and do many crafts. They enjoy the time spent with me and each other. I enjoy the pride they have in knowing what they can make with their hands, either for themselves or to give as gifts to their parents. I just hope I have time to complete all of the projects I have lined up and if not, then my grandchildren can continue in the tradition. I am so happy to hear that the post resonated with you and that you have found so much fulfillment with your craft! Thank you for this post. I am 59 and have been knitting and crocheting for over 50 years. I love to use them as a de-stress and unwind technique. Also, I’ve had arthritis in my knees and spine most of my life and it definitely takes my mind off the pain. Also, I’ve taught several co-workers who are over 50. Proves you are never too old to learn. I am so happy to hear that you find relief and fulfillment through your knitting and crochet! Thank you so much for publishing this post! I am 55 and have been crocheting for roughly 35 years. Your tips are right on point and so very true! There are so many wonderful charities that would welcome hand stitched projects! Even as I deal with Fibromyalgia and Osteoarthritis, crochet and learning to knit have been my blessing! As I battled Triple Negative Breast Cancer crochet was the perfect therapy for me – especially granny squares and repetitive stitches! Again, your post is so much appreciated and filled with great tips and resources! Thank you! Hi Patricia 🙂 I am so glad you found it helpful and informative!